Well I haven’t been detecting much because I have a ton of stuff going on right now. That doesn’t keep me from doing late night research and thinking about new sites. As I mentioned in previous posts our family is moving in mid May and we have been busy getting things together to make that happen. The other night the boys wanted to go to the library while the Queen was having a estrogen filled party at the house. I obliged and while they were looking at all the books they would like to have I hit the small corner room that held the local history. This all took place in the city we are moving into. I was kind of disappointed in what I found but I am certain if I dig deeper I will find more details. Saturday I attended a Wheat State Treasure Hunters class along with three other club members and we had a great class. There is something very rewarding about doing these classes but I can’t quite put my finger on it. Is it the fact that they hear our words and say “I’ve never thought of that”, is it the fact that we get people of all ages interested in the hobby, or is it simply the fact that I enjoy seeing people enjoy the hobby. I don’t know but I do know it is enjoyable. When I’m teaching an Motorcycle Safety Foundation class it is rewarding and I know exactly why. We have new riders that have never been on a bike getting around pretty well on them. Couple that with people who have been riding for awhile but never understood why things happen the way they happen and it makes you smile and realize you are teaching them something. In both cases I have very satisfied feelings towards how people respond. Whether we are teaching detecting or motorcycling we always hear great feedback. Maybe that is why I enjoy both so much. Now for the bad part of the the post. I don’t see a ton of detecting in my future because the house we purchased has an unfinished basement and it needs to be finished to meet our families needs. It will take some time out of my “play time” but I know it is temporary and while the work is going on it will probably be the hottest part of the season and I’ll be done just in time for the cooler fall hunting which I enjoy more anyway! Anyways thanks for reading and I promise I will get out detecting a little this upcoming week and have some goodies to share! This upcoming Friday marks 4 weeks until we close on our home that we sold. The bad news is that we still don’t have a home to move into. This creates some anxiety in the house as well as a certain level of uncertainness. This evening I got home from work and called a friend who wires houses to fix a couple of minor issues that came up in the home inspection that the buyers of our home wanted. We finished up at about 6:00 this evening and then the family had a bite to eat. 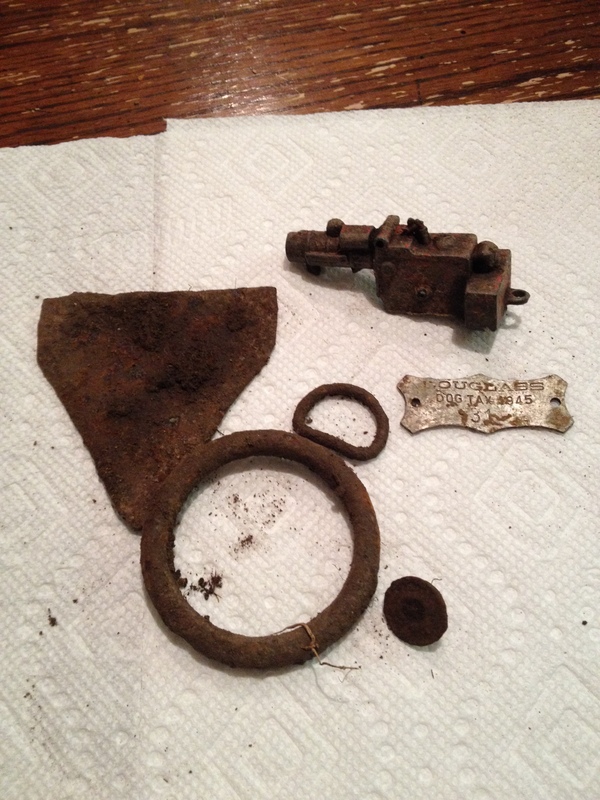 You may call me crazy but the weather was perfect so I got out and went detecting. I haven’t detected in a few days and my mind was telling me that I needed some swing time. I asked if the Queen minded me going out and she said I should go before I drove her crazy… I went to a homesite that has produced silver and wheats in the past. It is a pretty gnarly site that has a ton of iron. I knocked on the door and asked the Homeowner if he minded me detecting for the evening. Permission was granted. I also saw Maggie. She is maturing nicely. She is getting bigger and seems to be doing well! 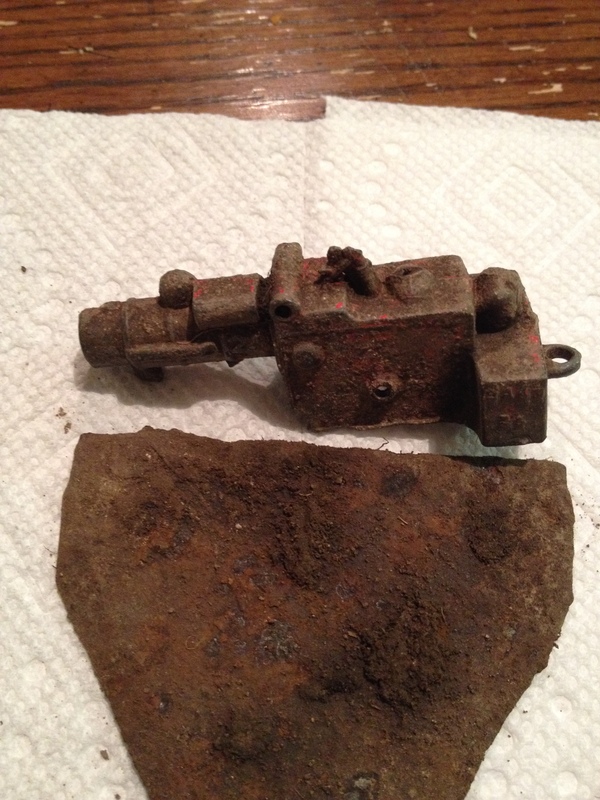 The hunt started off pretty good digging a few pieces of clad. Then I found a target that I couldn’t identify. At first I thought it was a cap gun but looking closer I believe I found an old toy steam tractor. Is it an old steamy? 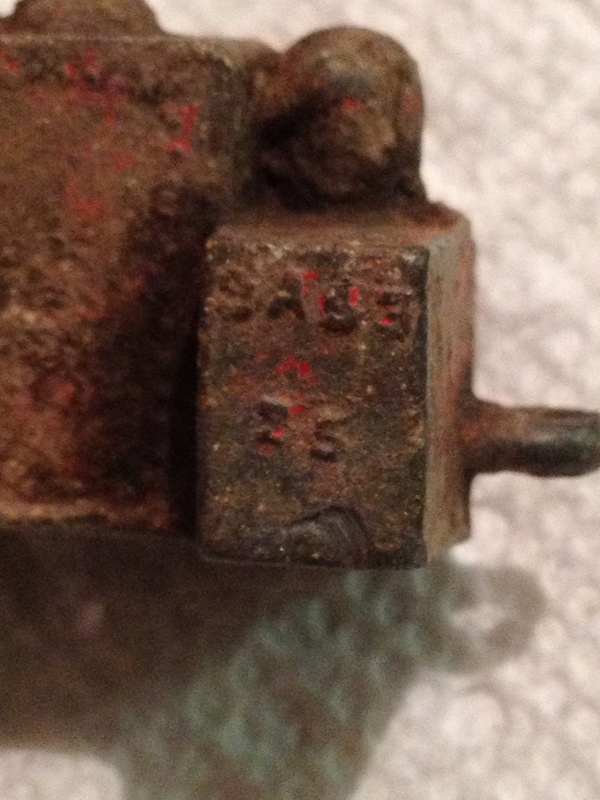 Backwards C and E with AS in the middle.. Could it be a Case 25..
Anyways Maybe you guys will see/know something more than I do about this find. The next target I dug is also kind of neat. It’s a dog tag from a neighboring city. Happy Hunting and Thanks for reading. The weather has been awesome, we got moisture in the form of rain a couple nights in the last week. This is a MDer’s dream.. Unless that MDer is in the middle of a house transition, Teaches MSF classes, and tries to maintain a sane home. Now I am not complaining because I love the fact that I’m busy. I don’t like sitting and waiting. Yesterday I participated in a class for the Wheat State Treasure Hunters and we had a blast. One thing I have learned through teaching MSF classes is that I really enjoy teaching adults. I also think that public speaking changes how people interact with each other. As it sits now we will be moving somewhere around mid May. We are only moving to a neighboring city but for some reason I have a huge desire to move across the big pond and find some old treasure. Our family has had an exchange student for the last 5 years and that has created this desire to travel abroad. 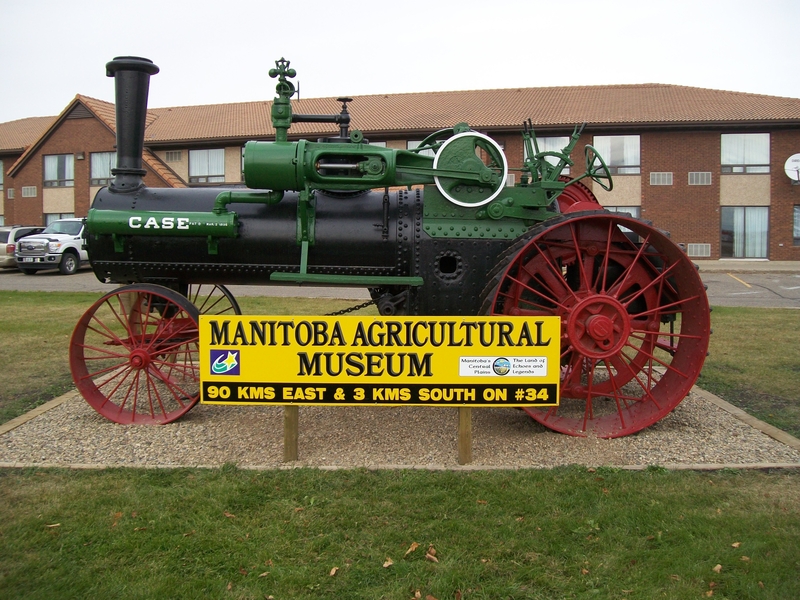 I would love to swing my machine over ground that holds treasure that is thousands of years old opposed to the 100 year old treasure that I currently search for. Anyways, I hope you get out and find some cool stuff in my absence.